A local middle school was experiencing the negative effects of expansive soil on a pair of very large, ice chiller thermal storage units used for the school’s refrigeration and cooling needs. 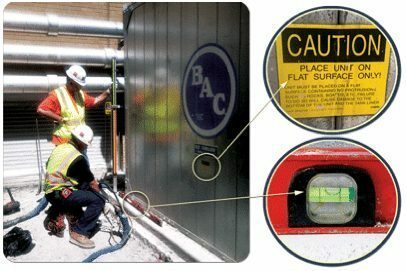 The unit’s warning signs state that if the supporting concrete surface is found to be uneven, substantial damage and malfunction to each unit was likely to occur. It was discovered that the unit’s connection lines were obstructed due to the settlement of the supporting concrete slab. Each unit was placed on flat, independent, reinforced concrete pads to maintain a continuous level elevation for support and proper unit function. The dry weight of the storage unit with the concrete pad is 32,000 lbs (16 tons). At maximum capacity, the two unit’s including the concrete pad each weigh over 133,000 lbs (56 tons). The concern was the potential that the units would be out of service for the school year. Expansive soils shifted beneath the concrete support pads causing an unsatisfactory level for the chiller units to continue functioning. To avoid damage to the units, both were taken out of service until a repair plan was initiated. 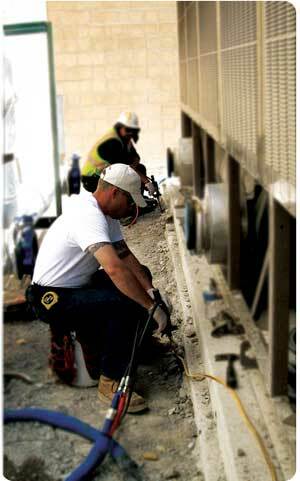 It was of the upmost importance to the school district, that the chiller units be functioning at capacity, and properly supported on their level, concrete pads in time for the upcoming school year. 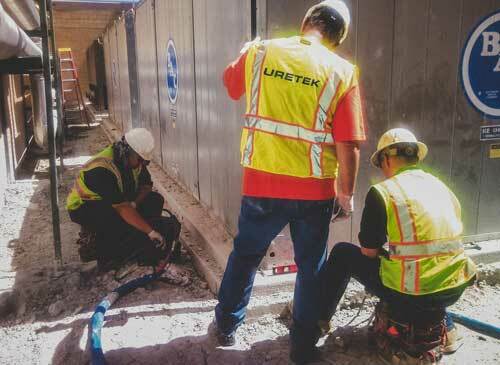 To avoid further downtime and potentially costly damages of each unit through relocation, the school district made the choice to utilize URETEK’s high-density, polyurethane grouting (also known as expanding polymer injection) technique. URETEK’s Deep Injection® Process was utilized to densify weak soil zones at specified depths to re-support each pad. After elevation profiles were taken, injection locations were determined to stabilize weak soil strata and realign the chiller units. Operators injected at depths of 3 feet at an angle to allow greater material coverage for maximum unit stability. First the weakest soil zones were stabilized, followed by the additional injections to realign the pads within the 3/4″ tolerance requirement for the ice chiller units to function properly. Eliminating the need for costly relocation of the units. Re-aligning the units back to their desired location to restore functionality. Repairing the root cause of the issue, by stabilizing the frail expansive soils underneath the units. In just ONE day, the repair was completed and the ice chiller thermal storage units immediately returned to service. The concrete pads supporting the units were re-aligned. In addition, the expansive soil’s load bearing capacity beneath the units was increased to properly support the storage unit’s weight at maximum capacity.